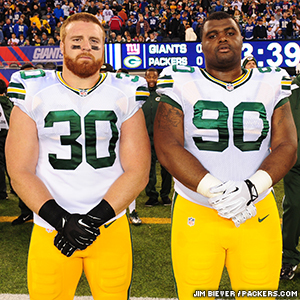 Packers FB John Kuhn and DL B.J. Raji are two of 26 players who have been named to the USA Football All-Fundamentals Team for 2013. The fifth annual USA Football All-Fundamentals Team recognizes NFL players who employ proper technique, particularly when blocking and tackling, which fosters better on-field performance and inherent safety benefits. A total of 11 players on offense, 11 on defense and four on special teams were chosen. Each player will receive a $1,500 equipment grant from USA Football to donate to the youth or high school football program of his choice. USA Football, the sport’s national governing body in the United States, is the official youth football development partner of the Packers, the NFL and each of the league’s other 31 teams. A fan vote will determine the All-Fundamentals Team captains, one each for offense, defense and special teams. Voting is open until Jan. 29 and can be done by clicking here. USA Football will award each of the three captains a $3,000 equipment grant to donate and an All-Fundamentals Team helmet trophy.